Larry Agran from Irvine, Calif., was the last candidate before the South Bend mayor to attempt the leap from a midsize City Hall to the White House. It didn't go well. He was described as "the longest of long shots" when he decided to seek the Democratic presidential nomination, and for good reason. He'd been the mayor of a city whose population, at barely 100,000, ranked 167th in America, falling somewhere between Cedar Rapids and Topeka. Outside of his hometown, almost no one had ever heard of him. "It's ludicrous," one pundit sniffed. But his party was desperate to reclaim the presidency and he was convinced that once they took a look at him, Democrats would see a winner — a progressive military veteran from a deeply conservative area running on a message of generational transformation. Pete Buttigieg of South Bend, Indiana? Larry Agran from Irvine, California, the last candidate before Buttigieg to attempt the audacious leap from a midsize City Hall to the White House. Agran ran in 1992, a generation ago, when the media ecosystem was far narrower and more constricting. To compare what he endured as a candidate then to what Buttigieg has already experienced now is to recognize just how drastically that ecosystem has been revolutionized — and what that revolution has made possible. Two months after announcing his bid, Buttigieg has already attained something akin to political celebrity status, at least with a slice of the public. There have been viral videos to go with gushing praise from elite cultural and political figures, appearances on marquee television shows and podcasts, an online fundraising windfall and a spark of life in the early polls. 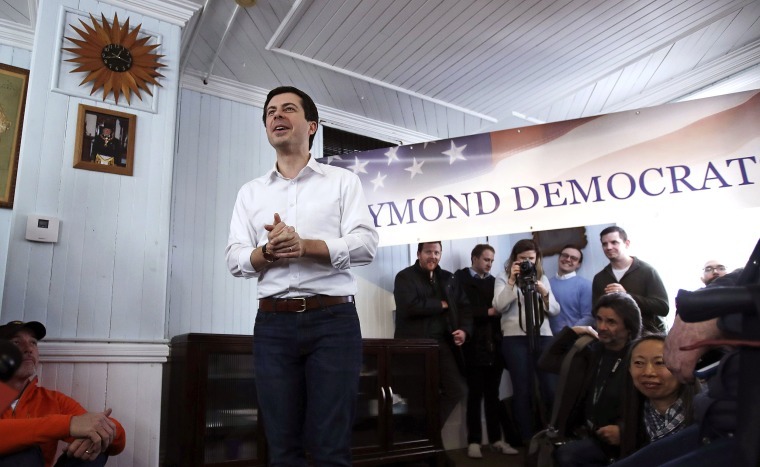 He's never won public office outside of South Bend, but nearly half of Democrats nationally now know Buttigieg's name, and even if his campaign falls short in the end, he's already succeeded in making himself a mainstream national figure. Watching this all unfold from his home in Irvine, Agran can only marvel. To call his '92 campaign "forgotten" would be a misnomer; few ever knew he was running in the first place. Dismissed by the gatekeeper class as a fringe character, he found himself shunned by television, barred from debates, cropped out of newspaper photos, and even — in an incident he still grows emotional recounting — handcuffed and arrested while trying to join his fellow primary candidates on stage in New York. "It's very, very painful to be excluded when you know you're worthy of inclusion," Agran, now 74, said in an interview last week. "That sticks with you a long time, you know. There's a certain humiliation." Democrats were confronting a leadership vacuum when Agran first got the idea to run. The party was on a losing streak, three straight national defeats and none of its heavyweights were eager to challenge President George H.W. Bush, who seemed invincible after the Gulf War triumph of early 1991. Momentous global change was afoot, too. The Berlin Wall was down, the Soviet empire in collapse, and the Cold War over at last. A brand new set of challenges awaited the country, and there was a debate to be had about what the priorities should be. Agran wanted in on it. At first, he tried to play a supporting role. Former Sen. George McGovern, who'd been the Democrats' 1972 nominee against Richard Nixon, was contemplating another bid, and Agran headed his exploratory committee. But when McGovern took a pass, Agran — like Buttigieg this year — found himself surveying the field and wondering: Why not me? Against a roster of current and former senators and governors, he’d be the only mayor, an advocate for issues and ideas the other candidates weren't interested in touching. He could point to a record, six years as mayor battling developers and implementing landmark environmental ordinances in a city exploding with growth. That Irvine was a Republican town (and part of famously conservative Orange County) and that Agran had won elections there anyway might be another selling point. He drew up a platform. The centerpiece was a "peace dividend" — radically slashing defense spending and using the money to deliver large payments directly to American cities. In August 1991, he held an event at the University of California-Irvine to announce his candidacy for president. "America," Agran declared, "can no longer afford the Cold War priorities of the 1980s." Today, a campaign like Agran's would put videos from that speech on YouTube, Facebook, Twitter and other social media outlets. They'd probably create a short, slick introductory video, too, aiming for viral attention. Buttigieg's 107-second announcement video, for example, has over a million views (and counting) just on his Twitter page. The online energy it generated when it was posted back in January led directly to broader media coverage of his candidacy. But there was no social media in 1991, no internet to speak of, and only one cable news network (CNN, which was far less focused on politics than it is now). That left Agran at the mercy of a relative handful of media and political elites who could decide if he was worthy of attention on national television and in major national newspapers — and, critically, of a spot on the debate stage. Over and over again, their decision was no. Again, the contrast to today is striking. For the 2020 race, the Democratic National Committee has established specific and attainable criteria for inclusion in debates. Anyone who can hit 1 percent in several national polls or generate 65,000 small dollar donations can get on the stage. There's no question that Buttigieg, and probably more than a dozen others, will qualify, and the debates — all broadcast in prime time on national television — will be seen by millions of Americans. When Agran ran, though, the standards were arbitrary. The chairman of the New Hampshire Democratic Party simply announced that "as far as I’m concerned, he's a minor candidate," and left Agran out. "That was the killer in the end," Agran recalled, "when I was kept out of the debates." Even when Agran caught a break, there wasn't much he could do with it. By far, his best media exposure came when PBS's "MacNeil/Lehrer Newshour" aired a 10-minute interview with him on a Friday night. It was well-received, with Agran's campaign getting dozens of calls from viewers who wanted to learn more. But with no social media to spread it around and build buzz, the interview vanished into the ether. Agran remembers being at a small campaign event in someone's home and being asked why he was never on television. "I said, 'Does someone have a VCR here?'" Someone did, and Agran played the tape of his MacNeil/Lehrer interview. "And after they saw me on the MacNeil/Lehrer Newshour, they erupted in applause, cheering the television. I'm standing right there — and they applaud the TV appearance! Which tells me, just confirmed, that unless you break through on TV, you just can't break through." Frustrated, Agran ultimately tried to force his way into the action. He crashed a candidate forum in New Hampshire hosted by Sen. Jay Rockefeller, standing in the audience, explaining his credentials and asking for a seat. When the audience rallied behind him, Rockefeller relented and Agran was given a seat with the other candidates. When he tried it again a few months later during a televised debate in New York, the response was different. "And just as I was making my pitch, police came charging up the stairs, down the aisle, grabbed me, and I repeated — while they were grabbing me — my request. And I was just dragged down the stairs headfirst, down two flights of stairs. And they arrested me, handcuffed me, put me in a police wagon." While Bill Clinton and Jerry Brown debated inside that auditorium, Agran remained in custody. He was charged with trespassing, disorderly conduct and resisting arrest ("The only resistance was my head hitting one stair after another — and it was the stairs that were providing the resistance"), but the charges were ultimately dropped. He stayed in the race through the Democratic convention, collecting 58,000 votes nationally and three delegates — a fraction of the 10.5 million votes and nearly 3,400 delegates won by Clinton, who became the nominee and then unseated Bush that November. A few years later, Joshua Meyrowitz, a professor of communication at the University of New Hampshire, used the Agran campaign as a case study to explore why some candidacies are taken seriously and others aren't. "Agran's was a campaign that often came close to the threshold between minor and major," he wrote, "but there was almost nothing he could do to cross it." When his presidential campaign ended, Agran returned to Irvine, led an effort to create a national urban presidential primary, and then threw himself back into local politics, even winning back the mayoralty before losing re-election in 2014. If he'd known what he was in for, Agran now says, he probably wouldn't have run for president. But he also says he's glad there's room now for a much wider assortment of candidates to be heard — including the mayor of a midsize city in northern Indiana. Asked if the attention that's been showered on Buttigieg — the CNN town hall, the late-night TV appearances, the social media chatter — ever makes him think, That should have been me! Agran chuckled. "Oh, yeah, I've thought of that a number of times." CORRECTION: (March 31, 2019, 10:08 a.m., ET): An earlier version of this article misstated Pete Buttigieg's political record. He ran unsuccessfully for Indiana state treasurer in 2010; it is not the case that has never run for office outside of South Bend, Indiana.